Happy National Cheesecake Day! What a fantastic holiday! I absolutely love cheesecake, but I’m not the best at making it. I can pull off a simple no-bake deal, but I wanted to do something a little more interesting for this post. If you’re a Buffy the Vampire Slayer fan, remember in Dead Man’s Party when Cordelia says “I’m the dip”? Well, that’s me! As in, that’s what I bring to this cheesecake party! 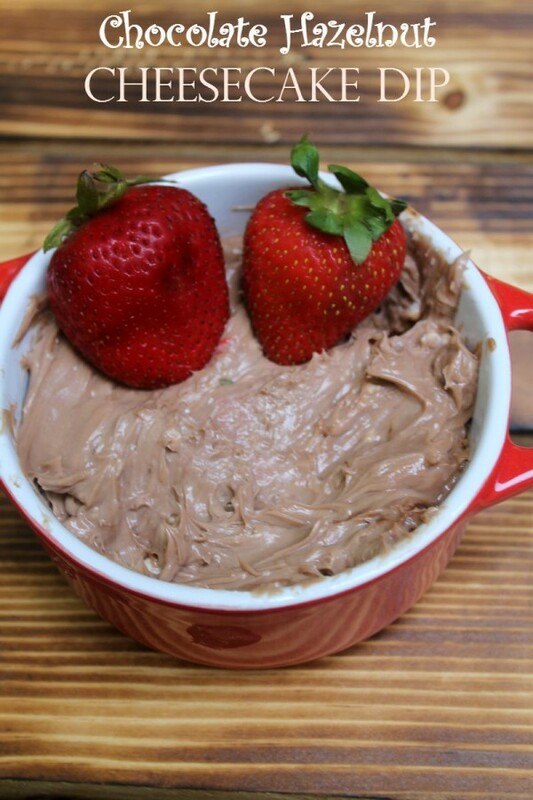 Cheesecake dip is awesome because it’s super simple to make. You really can’t mess it up. Seriously, if I can make it, so can you. I made this in minutes, all while fighting off Her Royal Kitteness Zoe, who smelled the cream cheese and wouldn’t leave me alone. I spent more time trying to take a decent picture of the cheesecake dip than I did making it! Let the cream cheese soften a bit, but not all the way. You don’t want it goopy, but you also don’t want it brick hard. Make sure you keep your whipped cream in the fridge until you’re ready to use it. Put your cream cheese brick in a medium to large metal mixing bowl. I like to use the large one because it gives me more space to maneuver, since I’m not the most graceful mixer. Either beat it on low with an electric beater or just use a fork to mush it really good. I used a fork. It worked fine. Add the hazelnut spread, powdered sugar and vanilla. Mix well. Add the whipped cream. Pronounce it “whip-ped” to make yourself feel fancy. Speak in weird accents to yourself as you blend everything until it’s smooth and all one color. Put it in a pretty crock and serve with strawberries, raspberries, graham crackers or pretzels. Other recipes similar to this one called for heavy cream instead of whipped cream, then said to whip the cream. I don’t get that. They make cream already whipped for a reason, right? So I used that instead. If you want to go old school, by all means, whip the heavy cream yourself. I’m all about the easy in the kitchen! You can also add chocolate chips to the mixture for more texture. I add chocolate chips to almost everything, but refrained this time. It’s kind of a miracle, really. If you have a kitten, you may need to add “remove kitten from counter” in between every step. That’s it! So easy, even I can’t mess it up! Do you have a favorite cheesecake recipe? Tell me about it in the comments! Oh, boy! I am not sure I like anything better than the combo of chocolate and hazelnuts. Looks amazing for fresh fruit. I love everything about this dip! 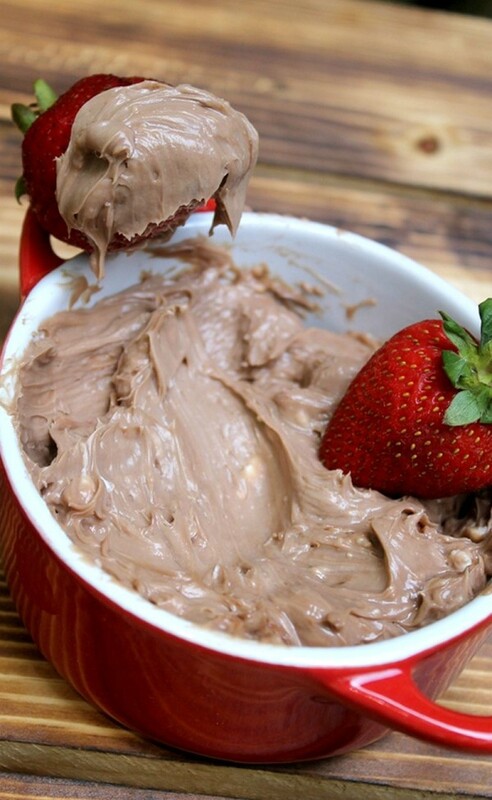 I love eating Nutella, and this is a easy no bake dip that i am going to make for my Summer barbecue with family this week. Thanks for sharing an awesome recipe! This looks like a tasty dip. My kids would love to dip pretzels in this in addition to fruit. Yum chocolate and hazelnut and cheesecake! How does it get any better. This looks like such a great dessert–especially the no bake part. No one wants to be stuck in the kitchen with a hot stove or oven when it is so incredibly warm out in the summer! Wow, This looks amazing and so easy to make. I will get the ingredients this weekend to make some! YUM! Anything with chocolate….hazelnut not such a fan This look so amazing and easy to make will try to use another flavor than hazel nut. No bake?! Now that is just awesome. I have a sweet tooth and that is definitely my kind of dessert! Sounds really easy to make! Will have to pass this onto some friends who like hazelnut. Did you just say cheesecake? I love anything with cream cheese. The dip looks so good. I need to try this. This sounds good to me. Hazelnut is a fave. It’s nice and subtle but still very distinct. yum. anything with chocolate and hazelnuts sounds amazing in my book! Cream cheese, chocolate and hazelnuts and whipped cream together? Oh wow. It is going to be a grand fiesta for my taste buds! Thanks for sharing this easy recipe. Oh to combine cream cheese and hazelnut is having the best of both worlds. I am looking forward to trying this out on my family. what an amazing dip, and I also love that it is so easy you can’t mess up! I’m embarrassed to admit this, but I just recently tried Nutella for the very first time and I LOVED it! I can’t wait to try this recipe. It looks and sounds so good and decadent! Thank you for sharing. I understand the step: remove kitten from counter. I’ve never had Nutella.